On January 11, 2017 the second Ocean Awards ceremony took place at Restaurant Ours in London. 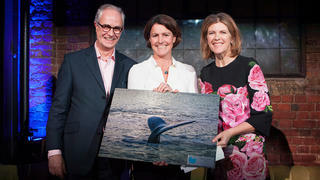 The awards, which celebrate the people and organisations who have made an outstanding contribution to ocean conservation, were held in partnership with the Blue Marine Foundation and sponsored by Y.CO. 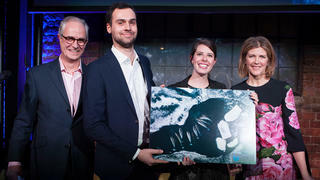 Pictured: Ocean Awards winner Susie Tomson accepts the Seafarers award on behalf of Ben Ainslie Racing from Charles Clover of the Blue Marine Foundation and Boat International editor-in-chief Sacha Bonsor. 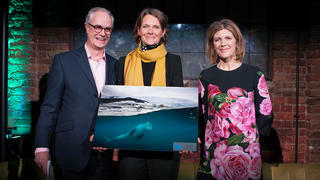 Each of the stunning photographic awards was donated by SeaLegacy. On January 11, 2017 the second Ocean Awards ceremony took place at Restaurant Ours in London. 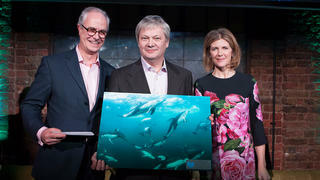 The awards, which celebrate the people and organisations who have made an outstanding contribution to ocean conservation, were held in partnership with the Blue Marine Foundation and sponsored by Y.CO. Pictured: Ocean Awards winner Susie Tomson accepts the Seafarers award on behalf of Ben Ainslie Racing from Charles Clover of the Blue Marine Foundation and Boat International editor-in-chief Sacha Bonsor. 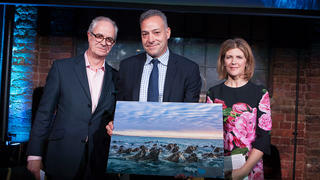 Each of the stunning photographic awards was donated by SeaLegacy. 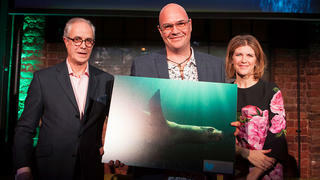 Simon Oliver accepts the Local Hero award on behalf of Dennis Bryan Bait-It from Project Sharklink. Tom Brzostowski and Caroline Spruill receive the Innovation award on behalf of Maria Damanaki of the Nature Conservancy. Alex Olsen of the Industry Group Agreement to Cod Fishery in the Northern Part of the Northeast Atlantic accepts the Responsible Business award. Claire Nouvian, founder of BLOOM, accepts the Policy award. The New York Times journalist Ian Urbina accepts the Public Education award. 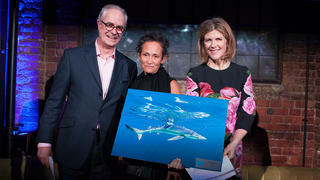 Tulik Beck, wife of UN Ambassador for the Oceans and Seas Stuart Beck, receives the Visionary award on her husband's behalf. 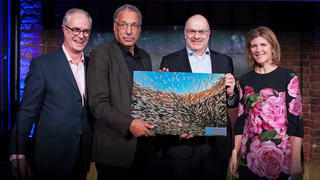 Dr Daniel Pauly (L) and Dr Dirk Zeller (R) of the Sea Around Us at the University of British Columbia accept the Science award.